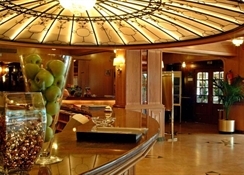 Are you travelling to Calella and looking for a hotel that offers various boarding options? Check out H TOP Amaika that offers bed and breakfast, half-board, full-board and all-inclusive accommodations. It also features proximity to the beach and is mostly visited by families, couples and solo travellers. H TOP Amaika features 228 guestrooms that are divided into twin rooms and plus three rooms—some rooms are customised to accommodate disabled guests. These modern rooms are designed with furnished private balcony, en suite with bath amenities and bedroom with twin beds. Rooms have minimum décor, but they’re fresh and bright. You will find safe deposit box, TV with satellite, hairdryer, air conditioning, WiFi internet, mini bar, heating system and telephone in each room—you might have to locally pay to use some of the room facilities. Rooms are cleaned daily, so are fresh linens and towels provided regularly—do approach the front desk for extra bed and crib. H TOP Amaika offers bed and breakfast, half-board, full-board and all-inclusive boarding options. 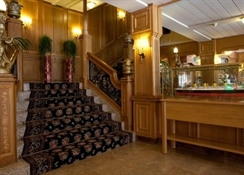 Its main restaurant serves breakfast, lunch and dinner in international buffet style. Breakfast is continental in style with plenty of options, freshly prepared and served. And at lunch and dinner, you will find local and international specialities on the spread—it features live show cooking and organises theme dinners. 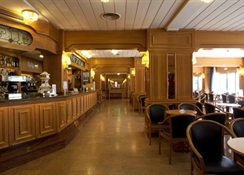 The main restaurant also houses a large bar where an extensive list of alcoholic and non-alcoholic drinks are served—do inform the management in case you’re on special/restricted diet. During the day, you can visit the poolside bar for some scrumptious light meals, snacks and classic cocktails and mocktails. 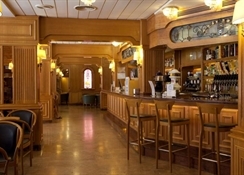 And in the evening, the main bar is the favourite destination for guests, as this is where classic and signature drinks are served along with lively events. Both young and old guests can have a gale time in the respective pools and play water gymnasium, aqua aerobic, water polo, and water volleyball, or learn swimming. Loungers and parasols are offers, but for beach towels, contact the front desk. You can relax and rewind in the spa that comes with whirlpool and sauna, while kids between the ages of 5 and 12 years are taken care of by professional in the mini club. And in case you’re a fitness conscious traveller, do visit the swanky gym and the recreational hall to sweat it out. You can rent bikes and cars from the travel desk located in the lobby—bikes and quadricycles are free for all-inclusive guests. The hotel also offers free access to all the H.TOP hotels between 10am and 7pm (reservation needed) and all-inclusive can have a gala time at Castle Medieval (Tordera) for half price (shuttles are available). And in the evening the animation team presents various games, and lively events and shows. Located in Calella, H TOP Amaika is a four-star hotel that houses 228 rooms. The hotel is very close to the vast sandy beach, about 150 metres. You will conveniently find tons of restaurants, clubs, bars, cafes and shops all around the complex. This is a destination ideal for holidaymakers looking for adventurous water sports activities, such as sailing, snorkelling, scuba diving, fishing, jet skiing, kite sailing and more. Bicycling, trekking and driving from one seaside town to the other are favourite pass-time for many travellers—you can visit Santa de Mar, Cante de Mar, Pineda de Mar, Malgrat de Mar and such other beautiful towns. You can reach Calella town by flying in to Girona-Costa Brava Airport, which is 40 km away from the hotel.